4. MHRD Skill Based Test under MOU Link between AICTE/MHRD and Youth4work. Click here for details. 5. 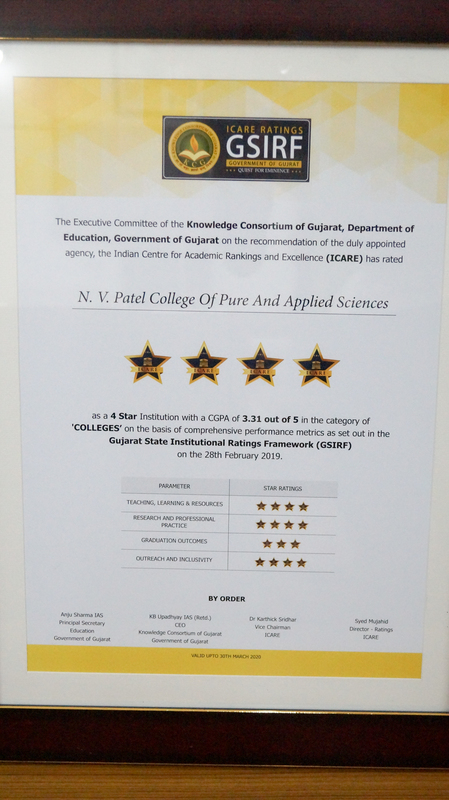 Gujarat State Instutional Ratings Framework GSIRF - NVPAS rated 4 Star by Indian Center for Academic Rankings Excellence with CGPA 3.31 out of 5 in the category of Colleges and 6th Position in Top 10 Ten colleges of Gujarat. Change is the salt of life. Without change human life becomes stagnant and sluggish. However, change is not easy to bring about because the process of change sets into motion a chain reaction of alterations, modification and improvements sweeping into the broader extensive structure of society, foraying into every single dimension of the, life on this earth i.e. social, economic, environmental, scientific, cosmic, political and global. 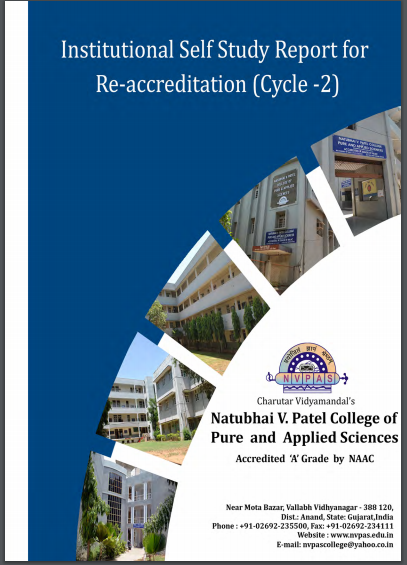 Natubhai V. Patel College of Pure and Applied Sciences (NVPAS) has been a dream destination for those aspiring to pursue their interest in the discipline of pure and applied sciences. The college offers some of the best academic resources for excellence in Ihese disciplines, be it by way of faculty, infrastructure, library, or computers. 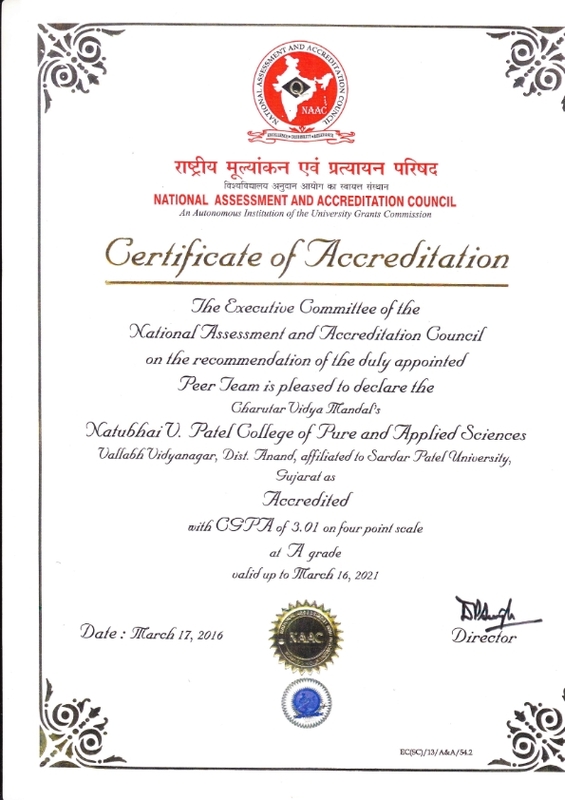 NVPAS attracts the best students from and across the country. 1. CONDUCIVE ENVIRONMENT FOR TEACHING & LEARING. 3. INDIVIDUAL EXPERIMENTAL WORK ON 1:1 BASIS. 4. VISITS TO INDUSTRIAL UNITS/ORGANISATIONS TO ENHANCE UNDERSTANDING OF THE SUBJECTS TAUGHT IN THE CLASSROOM. 5. 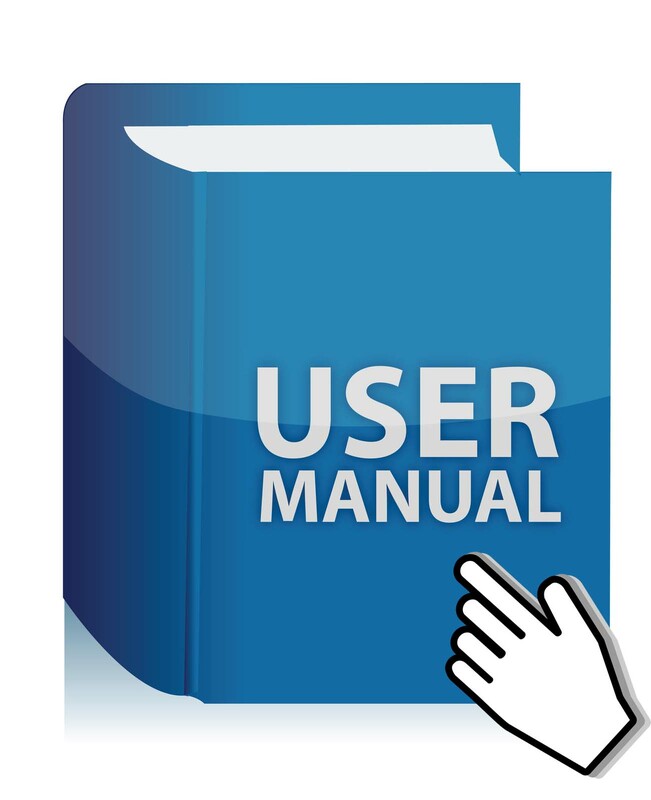 USE OF AUDIO – VISUAL AIDS FOR EFFECTIVE TEACHING. 6. INDIVIDUAL ATTENTION AND CARE BY TEACHER COUNSELORS. 7. TUTORIALS OF 2 HOURS PER WEEK FOR DIFFICULT. SUBJECTS/COURSES FOR FIRST & SECOND SEM. STUDENTS. 8. 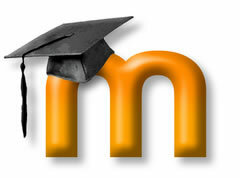 REMEDIAL CLASSES FOR ALL THE FIRST & SECOMD SEM. STUDENTS. 9. ARRANGEMENT FOR PROVIDING READING MATERIAL BY THE COLLEGE FOR ALL THE STUDENTS. 11. CONTINUOUS EVALUATION OF STUDENTS THROUGH WEEKLY UNIT TESTS CONDUCTED THROUGH OUT THE SEMERSTER. 12. 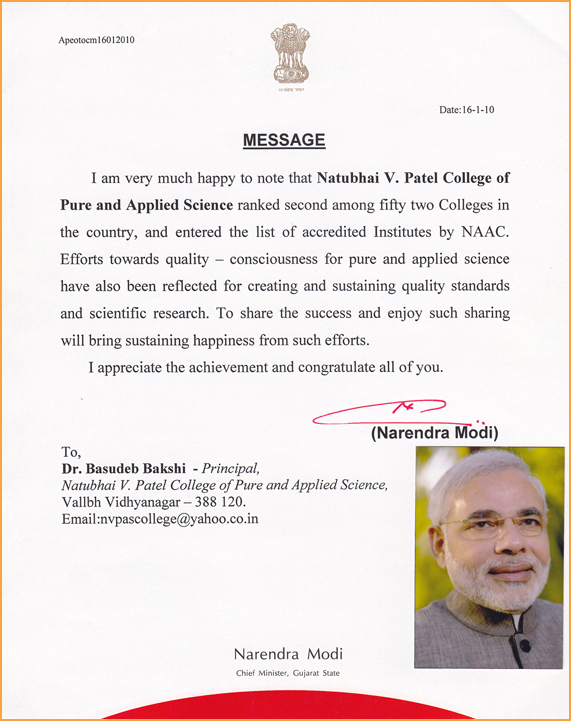 VARIETY OF EXTRA – CURRICULAR & CO –CURRICULAR ACTIVITIES. 13. PROVISION FOR ON THE SPOT ADMISSION TO ELIGIBLE APPLICANTS AGAINST THE PAYMENT OF FEES. 14. PROVISION FOR CAMPUS INTERVIEW FOR THE JOB PLACEMENT. 15. PERSONALITY DEVELOPMENT PROGRAMME OF 60 HRS. FOR ALL THE STUDENTS. 16. TIE UP WITH INDUSTRIES FOR THE FIELD EXPERIENCE. 17. CRASH COURSE FOR ACADEMICALLY WEAK STUNDENTS. 20. 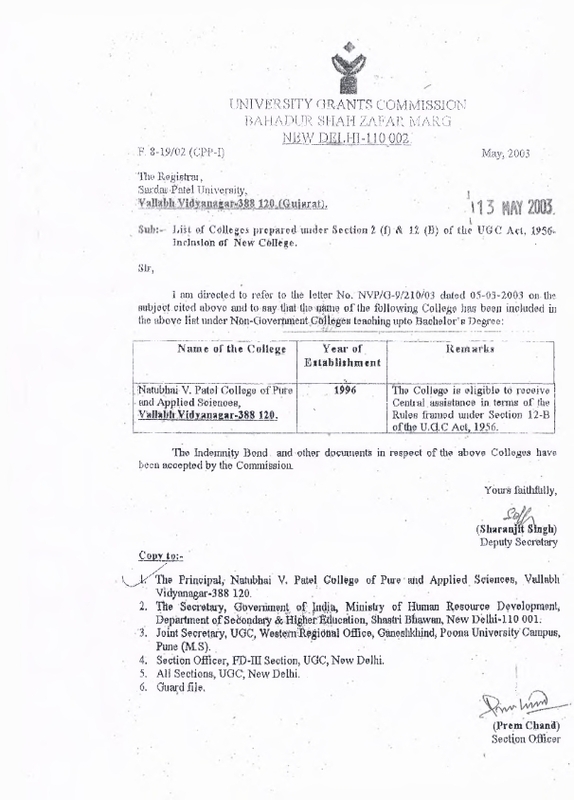 ARRANGEMENTS / ASSISTANCE FOR VARIOUS SCHOLARSHIPS FOR THE STUDENT.